At Team Office, our clients don’t call us only when they want to buy cool and affordable office furniture. They know we’re a complete workplace resource where organizations go to define their needs, establish budgets, and create space plans that work. Even if you’ve already got your space designed, why not have us take a look at it? We make it easy for you to have a great space – an office space that fits your particular business, personality and culture. Our team will work with you to create a unique space plan that makes sense and works. 1. Tell us about your space. Send us a drawing file, images or even a rough sketch if that’s all you have. If you don’t have anything to send, just tell us what you’d like to do and we’ll come out and field measure your space and create a drawing for you. 2. Work with our Team. 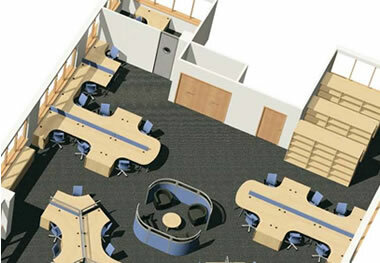 Our Team of space planning professionals will develop an accurate drawing that fits your needs. We’ll even include your existing furniture so you can see how everything will look and work together. 3. Get Ideas. It helps to see what other organizations have done. Take a look at these case studies and consider the possibilities for your space. To get the wheels turning, we’ll need to ask you a few questions. Send us your contact information or call 816-221-9155 and talk to a workplace consultant today.